Get competitions, offers and ways to make the most of your theatre trip. Receive details of what's on across the country and at theatres near you and your chosen locations. Plus, a chance to win a £100 Theatre Tokens Gift Card or eGift every month! You can add this location when you sign up to receive Theatre Tokens emails for offers and what's on highlights straight to your inbox. Divorced. Beheaded. LIVE IN CONCERT. From Tudor Queens to Pop Princesses, the six wives of Henry VIII take to the mic to rewrite 'Her-story'. 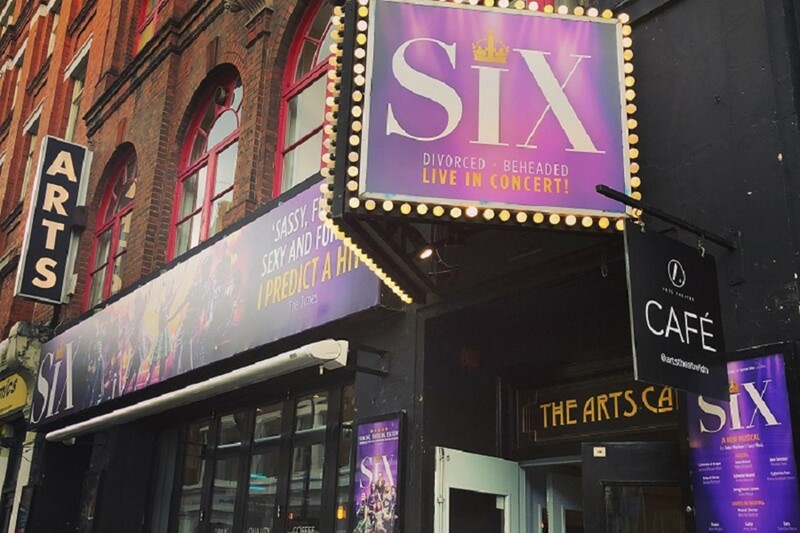 Following a sell-out UK tour, hit pop-concert musical SIX returns to the Arts Theatre. SIX, ‘the most uplifting piece of new British musical theatre’ (The Evening Standard) is the phenomenon everyone is losing their head over! The Arts Theatre is an independent commercial theatre situated in the heart of London’s West End, providing a dynamic programme of entertainment of all genres. The Arts originally opened in 1927 as a members-only venue for the performance of unlicensed productions. It was home to several determined, independent companies at this time, including Q Theatre and Hampstead Everyman, all specialising in producing experimental plays. As the theatre’s reputation grew for being an innovative venue, it was colloquially referred to as the ‘pocket national theatre’. During this time, it featured collaborations with many famous names. In 1940, it was subject to a ten-year ownership between the renowned actor Alec Clunes and John Hanau, producing a wide range of plays. Two years later, Clunes partnered with well-known author Peter Elstob to raise a £20,000 fund for the venue. In the 1950s, the Arts Theatre hosted Ronnie Barker’s West End debut in a production of Mourning Becomes Electra, directed by the great Sir Peter Hall. Hall’s production of this, alongside his English-language version of Waiting For Godot, was renowned in British theatre. Between 1967 and 1999, the theatre was home to a diverse programme which changed between the daytime and evening: during the day it presented premium children’s entertainment with the Unicorn Theatre, and at night it hosted performances including work by Tom Stoppard. LEICESTER SQUARE - Take the Cambridge Circus exit (Exit 3). They are the first street on the right. One hour before performance start time until one hour afterwards. Unfortunately, performances in Above the Arts are not accessible for wheelchair users. Guide dogs and hearing dogs are welcome in the auditorium, please discuss with the Box Office team when booking. Theatre Tokens is run by Society of London Theatre (SOLT) a not-for-profit organisation representing the London theatre industry. SOLT also runs the Olivier Awards, West End LIVE, Official London Theatre, TKTS, Kids Week & Official London Theatre's New Year Sale. Read About Us. - personalise our advertisements to you. To accept our cookies please click the button below, or for further details and the chance to specify your cookie preferences please click ‘more information’. You can change your preferences at any time by visiting the “Cookies Preferences” page, which can be found via our footer. View our Privacy and Cookies policies for full details.